The PS1508B is supplied with a pair of 7Ahr Lead Acid Batteries installed, giving a maximum of 14Ahr back up in the event of mains failure (see duty cycles below). The PS1508B will automatically switch between battery and PSU dependant on the presence of the mains supply. This provides you with uninterrupted use in the event of a power cut. The batteries will automatically recharge and the unit will switch back to AC operation when the mains supply is restored. 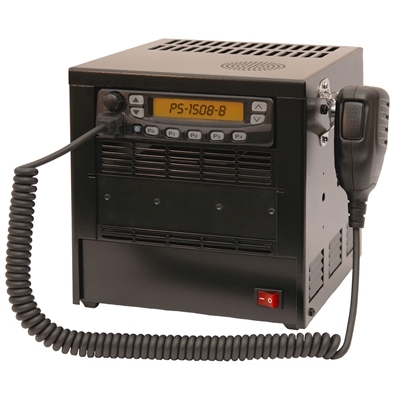 The Base Station Battery Back-up is ideal for any organisation that relies on continual radio communications. This unit could also provide your customers with the possibility of a portable solution for special events etc. • A duty cycle of 10% TX, 10 % RX and 80%. Standby gives battery backup of over 12 hours* use upon the mains failing (from fully charged). • A duty cycle of 5% TX, 5% RX and 90%. Standby gives battery backup of over 20 hours* use upon the mains failing (from fully charged).